The editors and staff at On Spec are heartbroken to learn that Harlan Ellison passed away this morning. Our condolences go out to his family and to his many loyal friends. He will be missed and mourned by generations of readers and writers who have admired him, learned from him, and on occasion, even fought with him. Find this on our new Book Reviews page. Kelly is an emerging Canadian writer to watch. 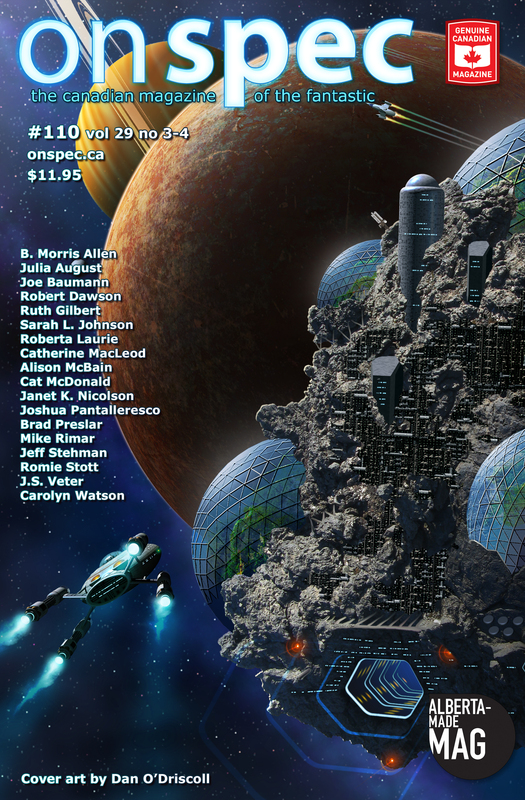 We are very proud to have a poem by Sarah Tolmie (“Ursula Le Guin in the Underworld”) in the current issue of On Spec. It’s a beautiful tribute to the life of an astonishing writer who influenced many of us in our writing. Sarah was interviewed recently by Colleen Anderson, another well-known On Spec poet and author . Take a look! The marvelous Alex Renwick (writing as Camille Alexa) has a story in this podcast, and its first appearance was as the first prize winning entry in our Apocalypse Issue Vol 24 No 3! You can see the text of the story, as well as listening to the podcast. Well worth your attention. We were recently asked about our 6,000 word limit for stories. Yes, we have published longer stories over the years, but those were few and far between. Because we are limited to a certain number of print pages over the course of the year, we had to make an arbitrary decision concerning a story length cut-off. It also affects our pay rates, since we don’t pay per/word the way some magazines do. That doesn’t mean we have closed the door on novellas, for example. After all, it’s our party and we can do what we want to. We’ll just be very selective. And in the meantime, if you have a story that falls in the “about 6,000 words” category, please give it a long and hard look before you hit that submit button. If your first 3-5 pages is bogged down with back-story, for example, chances are good that the first reader won’t even make it to the end. Your job as a writer, first and foremost is to maintain the reader’s interest. We are proud to announce that “A Clockwork Barista” by Kevin Cockle, is on the short-list for this year’s fiction selections for the Alberta Magazine Publishers’ Association (AMPA)’s annual awards. The awards will be presented at the AMPA banquet in March. Here’s something our subscribers who are active on social media can do. When your subscription copy of On Spec arrives in the mail, please post a picture of yourself holding the copy. Then pour yourself a cup of something warm and comforting and sit down for a while and have another awesomely good On Spec reading experience. Once you’re done, post something about a story you liked. Tweet about the superb cover art. Look up one of the writers and send them a nice email to thank them for their work. And tell all your followers about On Spec. Maybe someone will share your Facebook post. Maybe someone else will retweet. And maybe someone will stop looking at baby goat videos for just a few brief seconds and look up http://www.onspec.ca . The baby goats won’t go anywhere, we promise. And if we could get just one new subscriber because of something each of our current readers did to promote us, we’d be a very happy crew. We at On Spec are, as always, grateful for the support of our loyal readers and supporters. 2017 has been a year of “getting better organized”, and 2018 will be a year of “really getting better organized”. We bought lots of excellent stories during our 2017 call for submissions, and the editors are busy working with the authors to groom the stories for publication. Once that task is complete, we will once again, open to new submissions, and this will be announced here as well as through our Twitter and Facebook pages. As always, I am grateful for the super people who help get the issues into the hands of our readers, with no pay, I might add. In 2018, we’ll be at Calgary’s When Words Collide, Edmonton’s Pure Speculation, and other conventions during the year. When we can’t make it because of geography and time and financial constraints, we will be happy to have On Spec represented by Pat Flewwelling and her wonderful Myth Hawker Travelling Bookstore. People ask how they can help On Spec, and of course the very best thing you can do is to tell people about us. We depend on word of mouth as our best advertiser. Especially since the grapevine seems to be a tad slow in some regards, with people still being astonished that we a) have a digital version and b) continue to produce a print magazine! Get the message out that we are still here, and aren’t planning to go away any time soon. Best wishes from us all for a peaceful and safe year ahead. Diane and the entire On Spec Editorial and Production team.